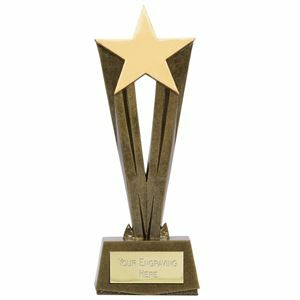 Made from high quality, metallic coated plastic, the Reach For The Stars Trophy is a superior quality award designed to offer fantastic value for money. 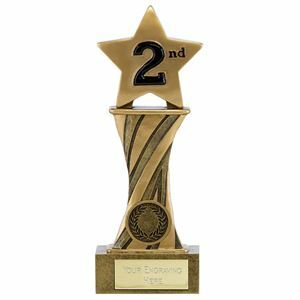 This beautiful plastic trophy is sculpted to look like a professional award, with a human figure holding a star in the air. The trophy stands on a shallow black trophy base. The Crest Star Jade Glass Gold Award is a 5mm thick premium jade glass award with large golden star centrepiece. Available in 4 sizes, this bevelled edge glass award also holds an engraved text plate, with up to 3 lines of engraving. The Crest Star Jade Glass Gold Award stands on a narrow gold pin stand. The Crest Star Jade Glass Silver Award is a high quality crystal glass award with bevelled edges. this 5mm thick glass award features a large silver star centrepiece with an engraved plate near the base. The Crest Star Jade Glass Silver Award stands on a narrow silver pin stand. The Showcase Star Trophy is a fantastically versatile star topped trophy available in 4 sizes. Made from high quality resin, this star topped trophy can be customised to suit any event. The Blue Shooting Star Figure Trophy is a vibrant light blue and gold figure top trophy set on a cream marble base. Available in a choice of sizes this metallic glazed plastic figure top features a large gold and blue star centrepiece with space for the addition of a printed logo insert in the centre of the star. The Star Cascade Award is a high quality resin trophy displaying 3 shooting stars. The three stars emerge from the centre of a loop of ribbon, from which hangs an embossed medal. The inside of the medal can hold a printed logo while the trophy plinth has space for an engraved plate, making the Star Cascade Award the perfect personalised award for any occasion. 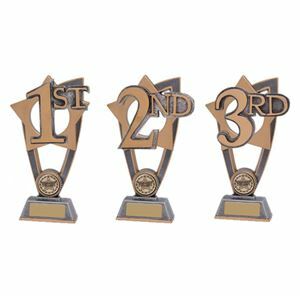 In bold golden numbering 1st, 2nd and 3rd places are set onto the golden star of the Star Blast 1st, 2nd and 3rd Place Trophy. The trophy stands on an antique silver and golden trim triangular frame that is mounted on a small rectangular plinth which can be personalised. This award is cast from premium plastic and coated in an antique silver and gold finish. 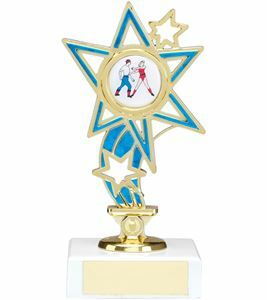 Made from high quality glazed plastic, the Shooting Star Trophy is a premium trophy featuring a large shooting star. Set on top of a black trophy base, the Shooting Star Trophy can be personalised to suit any prize giving. Available in gold or silver. 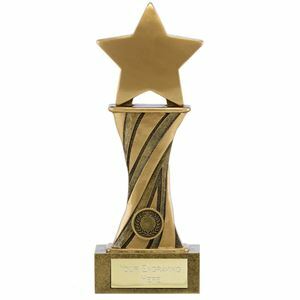 The Cherish Star Trophy is a tall star shaped trophy rising up from an rectangular base. 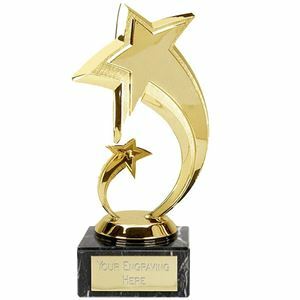 Made from a quality gold glazed resin, the Cherish Star Trophy is available in 5 sizes and can be personalised to suit any award. The Showcase Star Second Trophy is an ideal presentation piece for second place. Made from high quality glazed gold resin, the Showcase Star Second Trophy features a metallic gold star at the top with '2nd' in bold black font. The trophy stands on a twisted riser with personalisation options. Standing on a square base is the twisted central pillar of the Showcase Star Third Trophy. The star topped trophy is made from high quality glazed gold resin, for a premium finish. The star topper displays 3rd in black font, making this the ideal award for 3rd place in any event. The Showcase Star Third Trophy allows personalisation to suit any event. 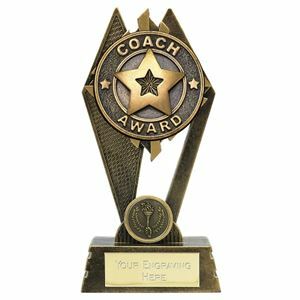 With a vector shaped frame, the Peak Coach Award Football Trophy displays a circular insignia with sun rays beaming from behind and a large star and the inscription COACH AWARD embossed on it. The trophy is moulded from quality resin and polished in an antique gold, while the insignia is made from premium plastic. The small base can take a logo and a FREE personalised engraving.